Vocal Ottawa sign posted at entrance to trail. 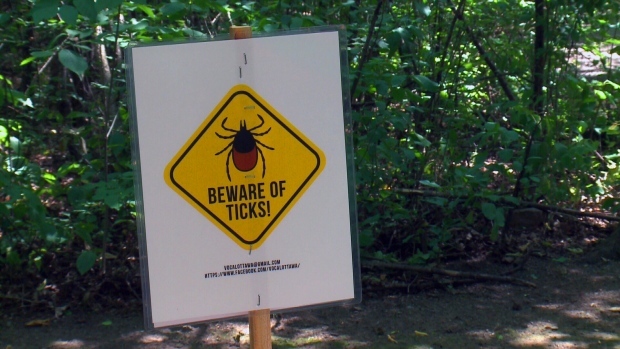 Government workers at the DND building off Carling will notice new signs in the wooded trails surrounding their buildings, warning of ticks and Lyme disease. The signs were posted over the weekend by an organization trying to raise awareness of the prevalence of ticks and the disease theycancarry. This is a path popular in the evenings with dog walkers and during the day, with employees at the Department of National Defence, many of whom had no idea of the risk they might incur from a simple noon-hour walk. If Mark Zawislak didn't know about ticks in these woods before, he sure does now. Zawislak works for DND in utilities and he and his co-worker had to go into the forest last week after a woman suffered heat exhaustion. Spreading the word about ticks spreading in our region is Lesley Fleming with a group call Vocal Ottawa. It stands for Voices of Canadians about Lyme disease. Fleming contracted Lyme disease several years ago. Fleming has posted signs throughout the trail system behind the DND building on Carling Avenue and she's walking the trails, carefully of course, talking to employees over the noon hour about the potential for ticks and Lyme disease. Emily Samojlenko had heard about the ticks in the forest, “Spread the word, don't spread Lyme disease through ticks,” she says. The NCC property by DND is a perfect habitat for ticks; a deciduous forest where they hang on the leaves and latch on to someone walking by. We know from previous studies that between 20 to 30 percent of the ticks in the Ottawa area carry Lyme disease and in some places, it's even higher. 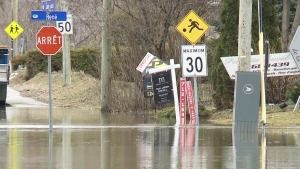 New research spearheaded by Dr. Manisha Kulkarni, an assistant professor of Epidemiology with the University of Ottawa, will be released shortly that will paint a clearer picture of the problem in the Ottawa area. “Then we're able to understand what is risk for humans to encounter ticks and to become infected with the pathogens that can cause diseases such as Lyme disease,” she says. In the meantime, Fleming will try to reach whoever she can before the ticks do.